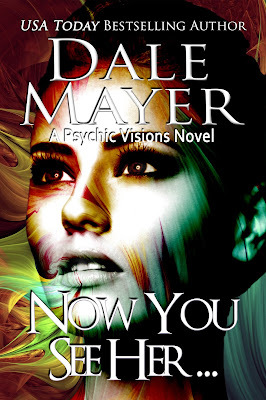 Selling Author Dale Mayer, NOW YOU SEE HER. And sometimes evil is stronger. away as she could. But it wouldn't leave her alone. and she's still being hunted. somehow – in a very unique way – entwined them both. muscles didn’t appear to move. Energy seizures? Was such a thing possible? sick on the physical system, in theory it should then be possible to get “sick” on the energetic level. typical of her to be the first one. Damn. house, but everything was foggy. As if she was looking through a light rain. “Right in front of you.” Dean’s voice came through a weird cloud. She rubbed her eyes but she still couldn’t see him clearly. “I can’t see you very well,” she muttered. Instead of a shocked exclamation, a warm hand landed on her shoulder, grounding her. Instantly, her vision cleared. He stood in front of her, a worried look on his face. features. She could feel the power of his concern. It was…disconcerting. wake her up, but she didn’t want to move. worse. Weird. She felt better touching him. Still, she could hardly hold his hand all the time. Besides, she was better than before she’d collapsed. She excused herself and used the facilities. Afterwards she tried to run her fingers through her hair. hospital, but apparently toiletries had not been among them. her. She heard Dean say something to her but where he stood was only a blur of energy. Turning toward the sound of Stefan’s voice, she realized he was no longer as clear as he’d been either. Then she fell to her knees. The men rushed to her side. She toppled face forward to the floor.